Our Dip Mix Gift Set offers a wonderful variety of dips, making it the perfect gift for the dip lover in your life! You will be ready for any party or gift together. 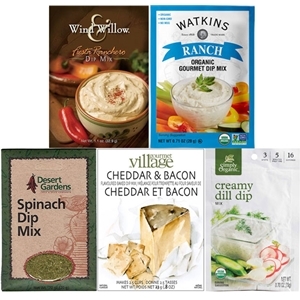 Our dip gift set includes 1 Wind and Willow Dip Mix, 1 Plentiful Pantry Dip Mix, 1 Gourmet Du Village Dip Mix, 1 To Market-To Market Dip Mix, 1 C.M. Company Dip Mix and 1 Laurie's Kitchen Dip Mix. They are all delicious, easy to make and perfect to serve with chips, crackers or veggies. Best of all, this gift set lets you decide which dips are included. This is currently unavailable. Please check back later or contact us to inquire about availability.